The PCB business card has long been a staple amongst the freelance EE set. It’s a way to show potential clients that you can do the job, as well as leave a great first impression. Some are simple blinkenlights devices, others have contact information on USB storage. We reckon that [Seamus] has really hit it out of the park with this one, though. That’s right- this business card riffs on the classic Magic 8-ball toy. Ask a question, shake the card, and it’ll light an LED with the corresponding answer to your query. Use it as a desk toy, or break deadlocks in meetings by looking to the card for the correct course of action. It’s a very tasteful build, showing off [Seamus]’s minimalist chops – consisting of just a decade counter, a tilt sensor, and some LEDs. When the card is shaken, the tilt sensor outputs a series of pulses to the clock line of the decade counter, whose outputs are the 8 LEDs. When the tilt sensor settles, it lands on the final answer. We think it’s a great card, which shows off both fundamental technical skills as well as a certain flair and creativity which can be key to landing exciting projects. It doesn’t hurt that it’s good fun, to boot. 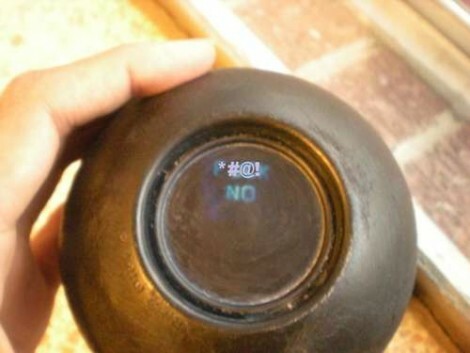 For another take on the Magic 8-ball, check out this build that can give you a Yes/No answer on demand. Imagine that your wife likes Darth Vader and wants help making important life choices. (Who doesn’t?) [bithead942] solves both problems in one project by gutting a Lego clock and making a talking animatronic Darth Vader 8-Ball-style oracle. Now his wife can simply press Darth’s head and her decision-making is handled by the Dark Side of the Force. You can see the result in the video below the break. The internals consist mainly of an Arduino Nano, a WTV020SD WAV playback chip, and some swanky servos. [bithead942] took a Dremel to the existing clock interior and found a way to make it all fit. The cloak helped, and the speaker was a good fit for the previous clock’s display. Then he used IMDB and combed through the Star Wars movies to find Darth Vader quotes that kinda sound like the 8-Ball’s answers. As [bithead942] mentions Darth Vader doesn’t really dwell much on the positive, so finding instances where he says “yes” was hard work. This is in contrast to the original 8 Ball which has a brighter outlook than a cheerleader on Prozac, but there’s a reason they call it the Dark Side. We really like the way the waist and arm servos work together to bring Darth to life. The added oak base with pull-out instruction card not only makes Darth look fancy, but prevents him from falling over when he leans forward to talk. All in all, a really nice build and well written-up with difficulties and their solutions. [Pete] was hard at work putting off a repair job for a friend, and wondered how much longer he could possibly procrastinate. With no fellow humans in earshot to which he could propose this question, he thought it would be great if he could ask a Magic 8-ball for an answer. Alas, he doesn’t have a Magic 8-ball, so he would have to build one if he wanted his answer. Continuing to delay the repair job, he scrounged around his house and dug up an ATmega328 to control the 8-ball and a LCD panel to display the sage-like responses. He wanted the 8-ball to be as authentic in operation as he could, so he had to locate some sort of sensor that would register if the device had been shaken. With no accelerometer at hand, he opted to use a mercury tilt switch that he scavenged from an old thermostat. 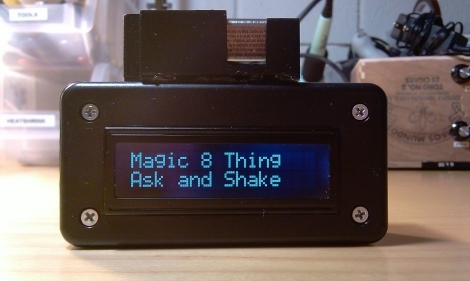 He wrote some software to display the responses from the original Magic 8-ball when shaken, then he threw the components together in a small plastic case. If you’re in the mood for more Magic 8-ball shenanigans, check out these posts!